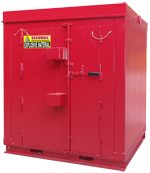 Securall Products’ Explosive Storage Magazines provide safe and compliant storage options for both High and Low Explosives. We manufacture Type 2, Type 3 and Type 4 Magazines for indoor or outdoor uses. Our Type 2 Outdoor Magazines’ Bullet-Resistant design meets or exceeds the ATF specs at CFR 555.11 (pg. 75 ATF Ruling 76-18 (b)). All Securall Magazines are designed to be Weather, Fire and Theft Resistant. Additionally, Securall is the only Magazine Manufacturer currently offering an optional upgrade of 2 hour Fire-Rated Walls. 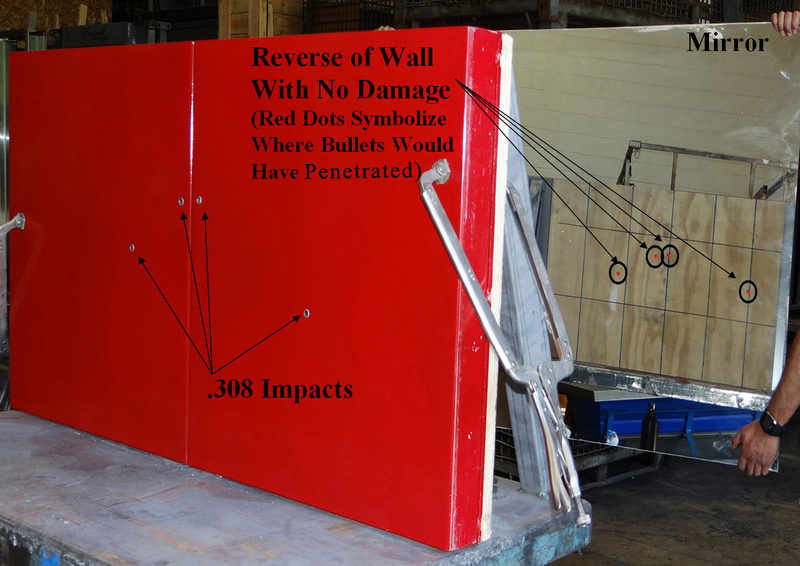 Also, our proprietary wall design has been tested and rated to withstand F-5 Tornado winds and associated impacts (Texas Tech University Wind Science and Engineering Research Center). Various industries and services require the use of explosives and ammunition as a means of doing business. As such guidelines have been put in place to allow these materials to be used, transported and stored properly. Magazine is also a term used for a place where large quantities of ammunition are stored for later distribution. Magazine is the name for an item or place within which ammunition or other explosive material is stored. We are custom manufacturer of ammunition & ammunition components including less lethal & non-lethal ammunition storage magazines & bins. Ammunition types include pellets, soft air ammo, 12 g powerlets, 88 g pre-filled cylinders, diabolo, cylindrical wadcutter, pointed, super match, BBs, domed & hollow point. Caliber & ammunition type varies according to model. Dies for pellets are made from a single set of heat treated, water-resistant metal tools. Other products include rifles, pistols, CO2 guns, soft air guns, kits, slingshots & shooting ranges. Storage magazines & bins are available in various models, sizes, holding capacities & configurations. Options & accessories are also available. 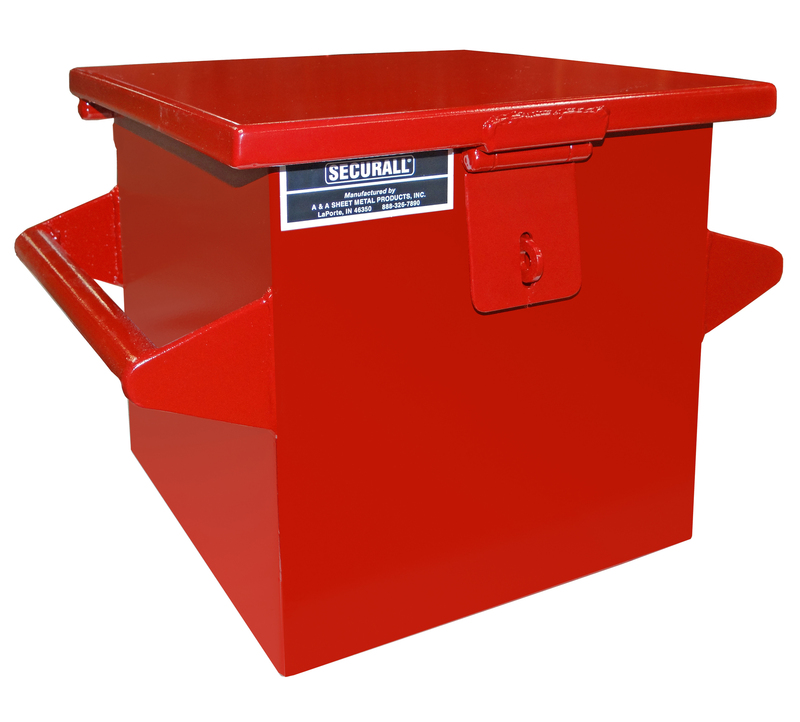 Securall Arms, Ammunition, and Explosives (AA&E) storage magazines offer safe and proper storage options for High and Low Explosives and Ammunition. We manufacture Type 2, Type 3 and Types 4 Magazines for both indoor and outdoor placement. Our Type 2 Outdoor Magazines Bullet Resistant Design Meets or exceeds ATF specs 27 CFR 555.11. (Pg. 75 ATF Ruling 76-18 (b)). Type 2 Magazines are made for the storage of High Explosives and are made for indoor or outdoor storage placement. Per ATF regulations an indoor magazine may not hold more than 50 Lbs. 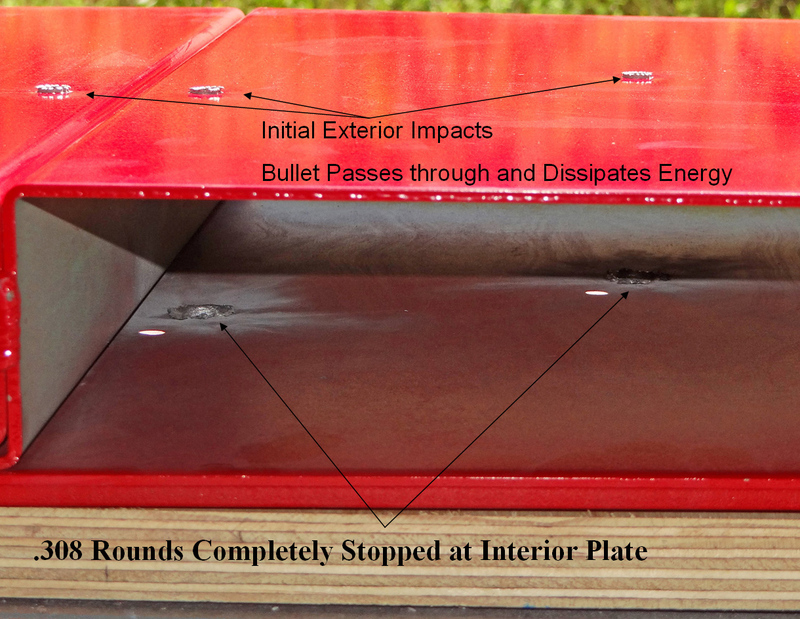 of explosive materials and outdoor magazines must be built to a bullet resistant design. 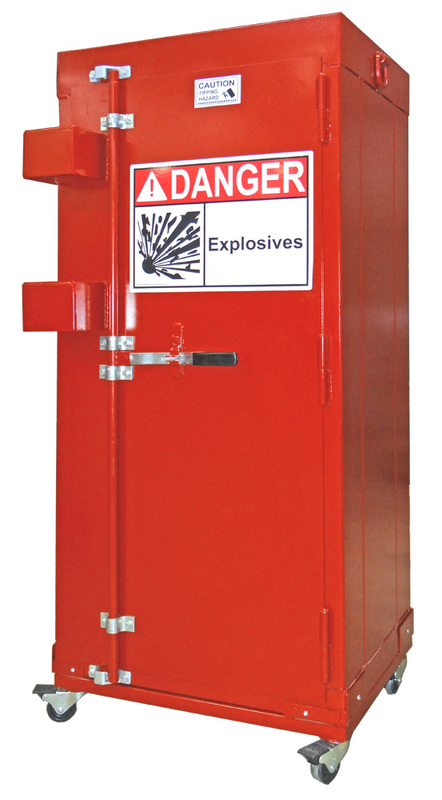 Our Explosive Storage Magazines are portable and can be placed in most locations with a flat surface. 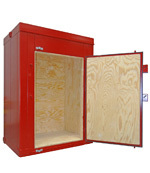 These magazines are built for turn-key installation which also allows for easy relocation if needed. Type 2 Outdoor Magazine Bullet Resistant Design Meets or exceeds ATF specs 27 CFR 555.11. (Pg. 75 ATF Ruling 76-18 (b)). ** The product images shown are for illustration purposes only and may not be an exact representation of the product. Approval - Meet or exceed federal standards developed by the ATF. 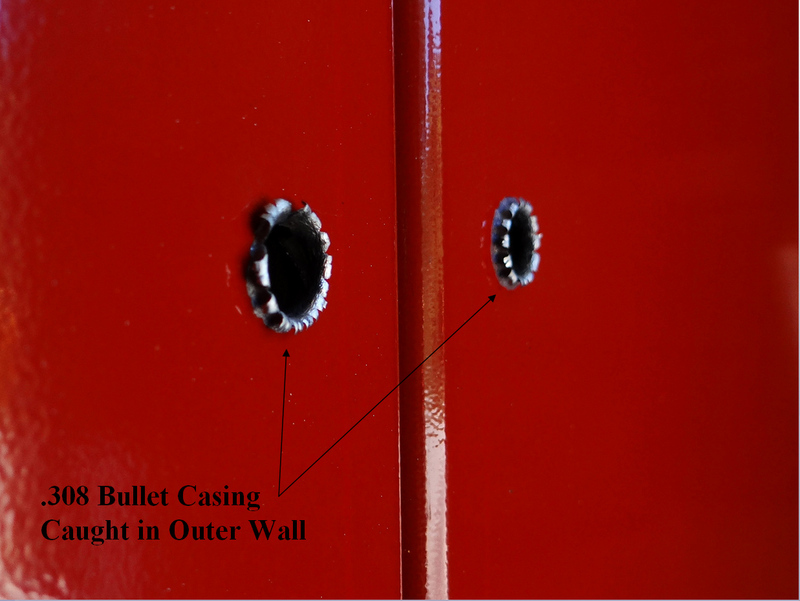 Bullet Resistant Design Meets or exceeds ATF specs 27 CFR 555.11. Wooden Shelves, 14" Deep linear ft.
2 Hrs fire rated wall. Bullet Resistant Design Meets or exceeds ATF specs 27 CFR 555.11. (Pg. 75 ATF Ruling 76-18 (b)). 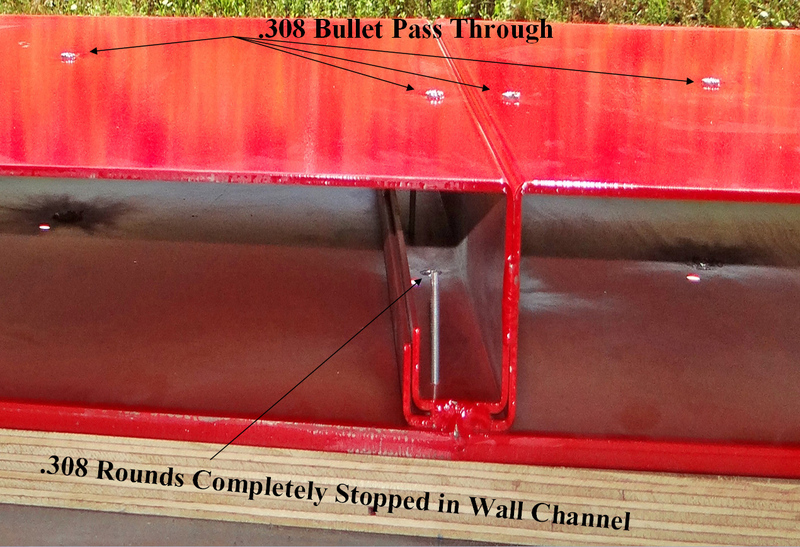 Magazine constructed with double wall, welded construction with 3” airspace throughout. Exterior walls made of 10-gauge, formed, Galvannealed Steel. Roof is either 12 (Fire Rated) or 18 gauge galvannealed steel. Interior walls made of 3/8” Steel Plate. Interior of structure lined with 1" Plywood (Ceiling 1/2" and Floor 3/4" Plywood). All spark-producing material is covered or sealed. 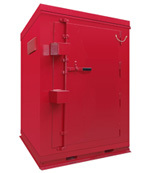 Door – 63”H x 42”W (M200 - 1200 Magazine). 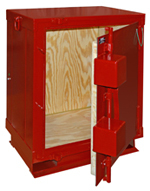 Door – 80”H x 60”W (M1600 - M8000 Magazine). Exterior Mounted Cam Lock. (2) Hooded Padlock Hasps at 45° Angle. 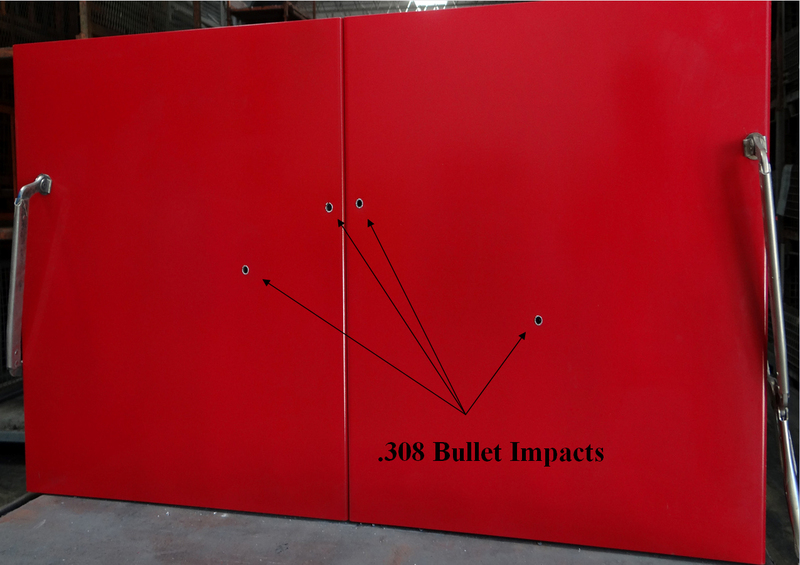 Door made of Bullet Resistant construction with a 1” overlap on all sides. Door Panels grounded to wall face. Inlet Vents for natural ventilation. 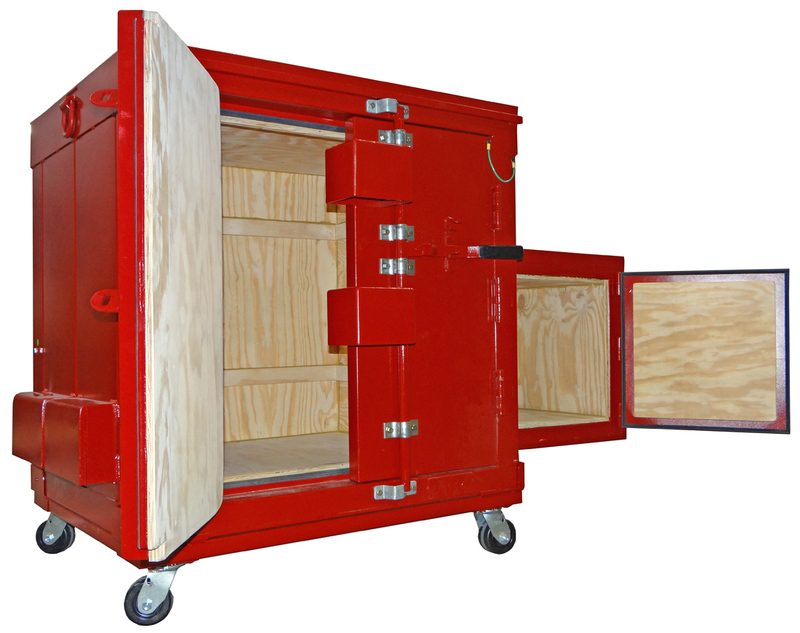 Removable Caster Assembly (800Lb. capacity per Caster) - or - I-Beam Base Support with Fork Channels. NOTE: Magazine may require State Approval. Please check with your Local Authorities (ie: Fire Marshall) to determine if State Approval and/or State Seal are required. Additional charges and lead times may apply. Commonly called Day Boxes these magazines are designed to secure smaller amounts of explosives for use in the field. 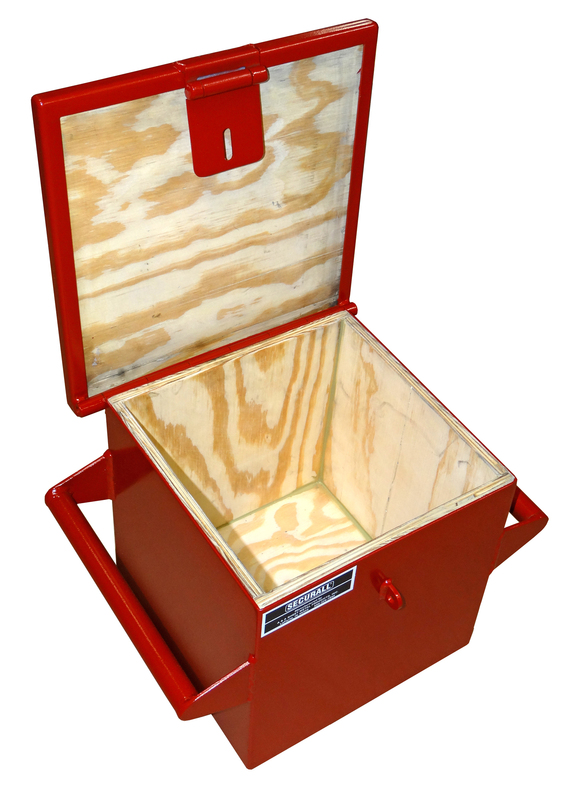 Day Boxes are easily portable and can serve to safely transport and store explosives to and from the work site. 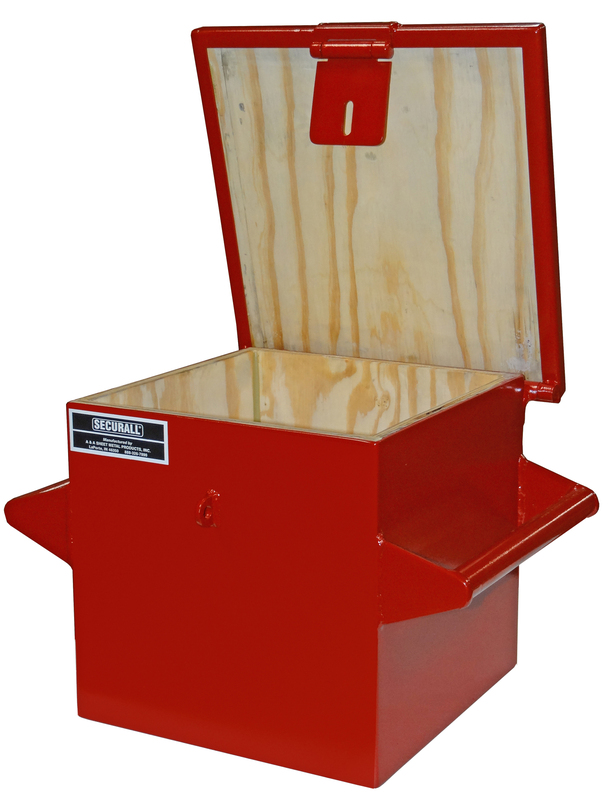 These can be mounted to a vehicle or trailer if desired, or left free standing to be carried. 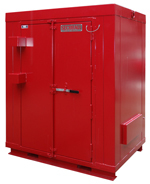 Units are manufactured with a 12 Gauge, single wall construction lined with a non-sparking material. 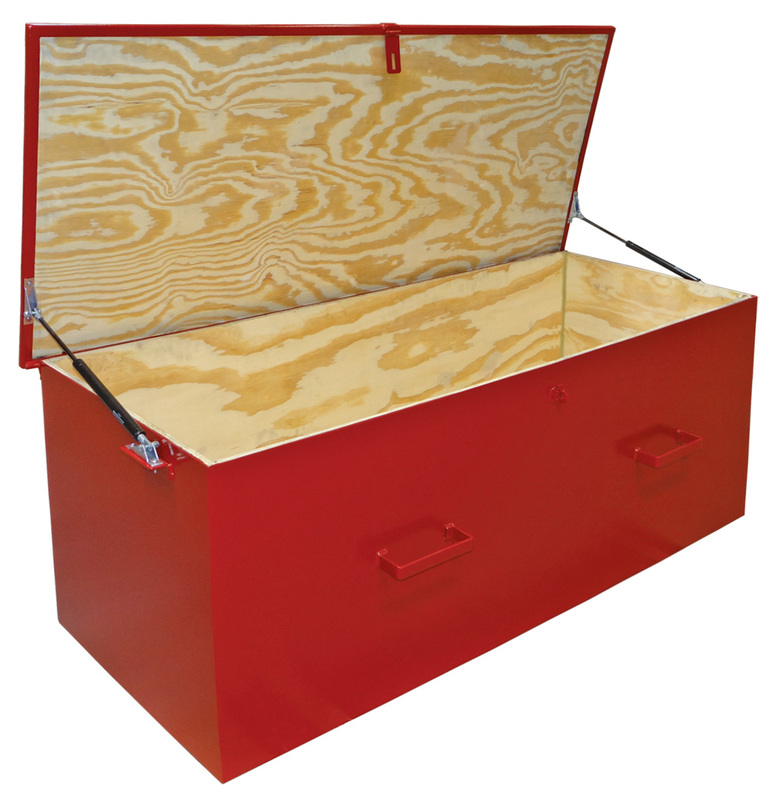 Image 1-1 Type 3 Daybox. 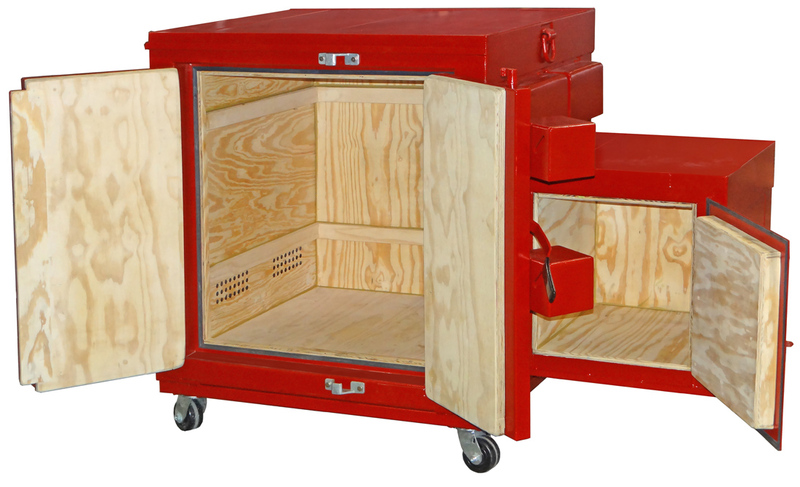 Image 1-2 Type 3 Daybox. Image 2 Type 3 Daybox. Image 2-1 Type 3 Daybox. Image 2-2 Type 3 Daybox. MT312 Explosive Magazine; Dimension 12" H x 12" W x 12" D ; Approx. Ship. Wt. 60 Lbs. Manufactured using 12 gauge steel(Singlewall Design). Interior of structure lined with 1/2" Plywood. 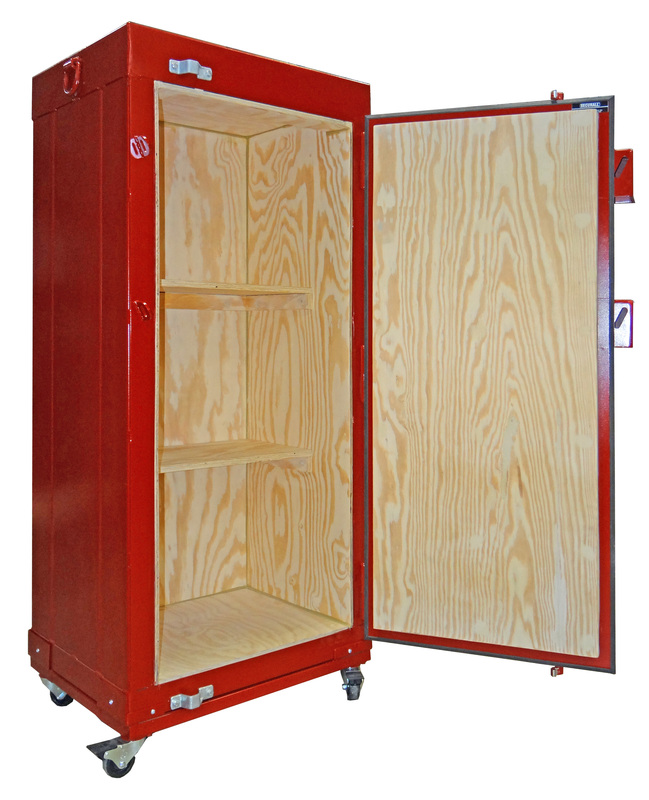 All spark-producing material is covered or sealed. Door - (1) Padlock Hasps at 45° Angle. Door made with an 1” overlap on all sides. Hinges and Hasps are attached by welding, riveting, or bolting (nuts on inside). Image 1 - Wall Design. Image 2 - .308 Bullet Impacts. Type 4 Magazines are designed to store Low Explosives and can be placed indoors or outdoors. Our Type 4 magazines are made of steel and are all weather, theft and fire resistant. These units are constructed of a 12 gauge, formed, outer wall and are lined on the interior with ½” plywood sheets. 2 hooded hasps for padlocks are placed on the door to prevent tampering and forced entry. Type 3 Day Boxes are especially designed to be transported, but both the Type 2 and Type 4 Magazines are also designed to be moved if needed. Our Magazines offer various options for mobility. 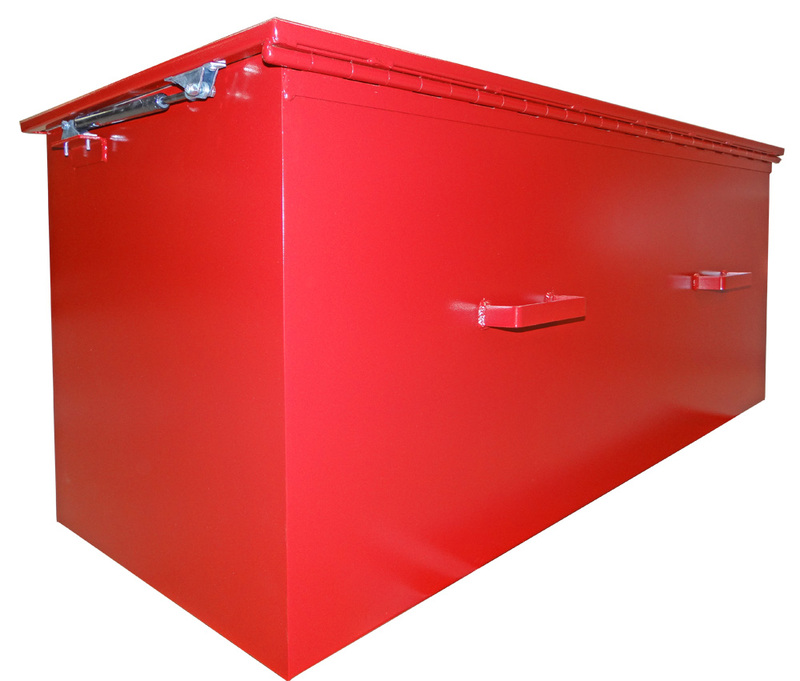 Lifting Lugs come standard and we offer Fork Channels and Casters as well. Also, on larger units we place I-Beam supports running the length of the structure and the Magazines can be dragged along the surface by the ends of the I-Beams. 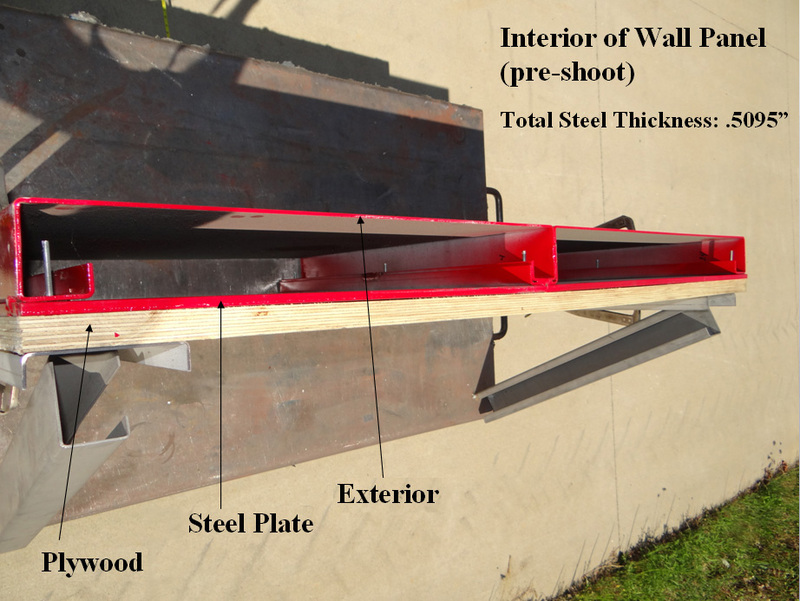 Exterior walls made of 12-gauge, formed, Galvannealed Steel. Roof is either 12 (Fire Rated) or 18 gauge galvannealed steel. Interior of structure lined with 1/2" Plywood (Floor 3/4" Plywood). 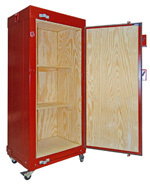 All spark-producing material is covered or sealed. Door - 63”H x 42”W (M200 - 1200 Magazine). 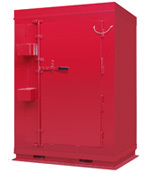 Door - 80”H x 60”W (M1600 - M8000 Magazine). Exterior Mounted Cam Lock. (2) Hooded Padlock Hasps at 45° Angle. Door made with an 1” overlap on all sides.